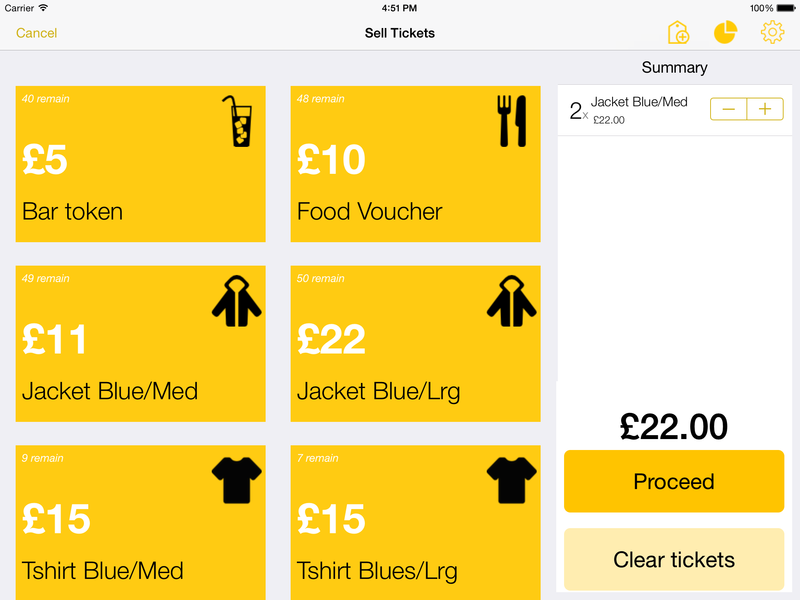 The RapidScan Box Office app can be used for non-ticket items, such as merchandise or Bar Sales. 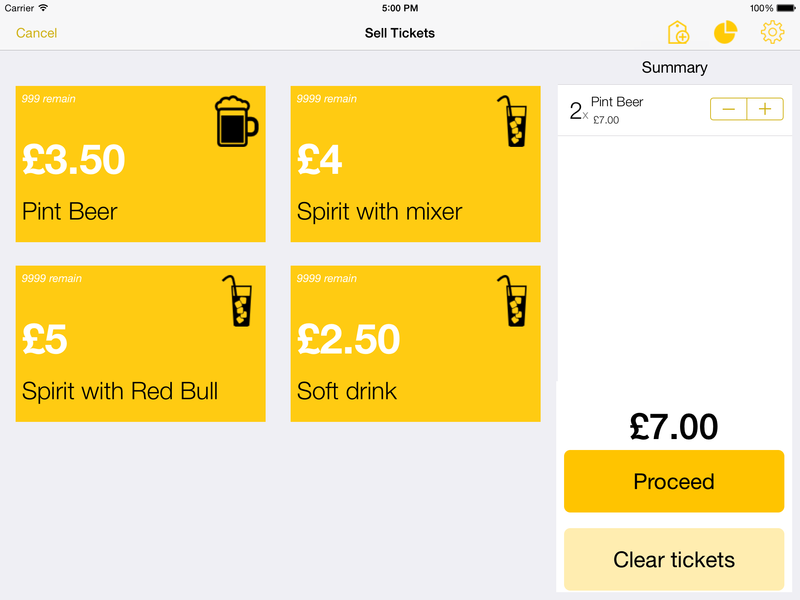 The app can be configured to sell items directly on your bar, or drinks tokens. Ensure your event is setup in the Promotion Centre, with the correct dates and event start/end times. We'd advice you to create a separate 'bar' event rather than adding them to your main event. This keeps your sell screen separate, with just bar products showing. Make sure you set this event to 'Private' so it doesn't show up on Skiddle's events guide. Enter the name of the item, and select a icon. The icon will denote which icon is used within the app - this makes it quicker to recognise different ticket types quickly when selling. For example, if you're selling drinks tokens, the name might simply be "Drinks Token". If you're using it to sell individual items, an example might be "Pint of Lager"
You don't to print a barcoded receipt for these items, to untick the 'print receipt' box for each ticket you add. Enter an allocation - the min/max control how many tickets can be purchased in each order. As you won't need to limit this, we'd advise setting this to a large number such as 9999. Enter the price, or 0 for free tickets. We don't add any fees onto the price, so whatever you enter here is what the customer will pay. Save your item. The ticket will go live immediately on all devices. You can add as many tickets as you wish by repeating steps 3-6. Simply click the 'add Tickets' icon again, and use the up/down icon to drag the item up/down with your finger. The order shown on screen is the same as the order on the iPad sell screen. To make things quicker, you might want to setup some shortcut items. For example if you're selling drinks tokens, you might want to enter a '5x Drinks tokens' and a '10x Drinks tokens' - this way you can easily select large quantities without having to select each one multiple times.